If the Boston Red Sox are going to win the World Series in 2018, they may have to do it without their longtime leader, Duston Pedroia. While speaking with reporters on Wednesday, Pedroia cast doubt on his chances of returning from a knee injury that has kept him on the DL for most of the season. The Red Sox have been fine without him. But they’ve always planned on Pedroia being part of the team at some point this season. It’s now looking like that won’t be the case. Pedroia made his season debut in late May following offseason knee surgery. However, he played in just three games, going 1 for 11 at the plate, before returning to the DL because of inflammation in his knee. Soon after he returned, Pedroia realized that his knee had not yet healed completely. The plan is for Pedroia to continue to rehab away from the team. He’ll have an MRI in a little over a month that will determine his next move. But he says he won’t push himself if his knee isn’t ready. 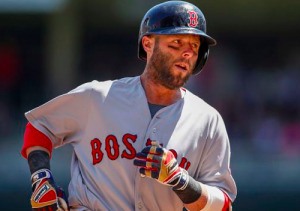 Even if his knee is fully healed in five weeks, by the time he resumes baseball activities and plays in minor league rehab games, it could easily be September until Pedroia is back in the majors. At that point, the Red Sox are likely to be in a tight race for the AL East crown with the Yankees. Boston may not want to risk Pedroia playing if every game could mean the difference between winning the division and having to play in the wild-card game. Pedroia and the Red Sox also need to think about the long term. Pedroia still has three years and $40 million left on his contract after this season. Pedroia obviously wants to play out that contract and the Red Sox don’t want to waste that money on an injured player. In that sense, it’s best for both Pedroia and the team for him to sit until he’s fully recovered. In the meantime, the Red Sox will carry forward with Eduardo Nunez and Brock Holt at second base. Nunez has failed to replicate his outstanding numbers of a season ago. Holt, meanwhile, is having a decent year but brings little power to the table. Boston recently signed veteran Brandon Phillips on a minor league contract. However, the Red Sox could also explore their options on the trade market. Without Pedroia, the Red Sox have still amassed the most wins in baseball. However, they would love to have his experience and leadership come September and October. There’s a slim chance his knee will be fully healed and he’ll return. But at the moment, it looks like anything the Red Sox do in the postseason, they’ll have to do without Pedroia.